By the looks of my Publix shopping trip posts, I’m sure you think that we don’t eat very many veggies. On the contrary. Along with our staples, I buy our fruit/produce at Aldi because they have unbeatable prices. I don’t share those shops with you because, well, they’re rather boring. 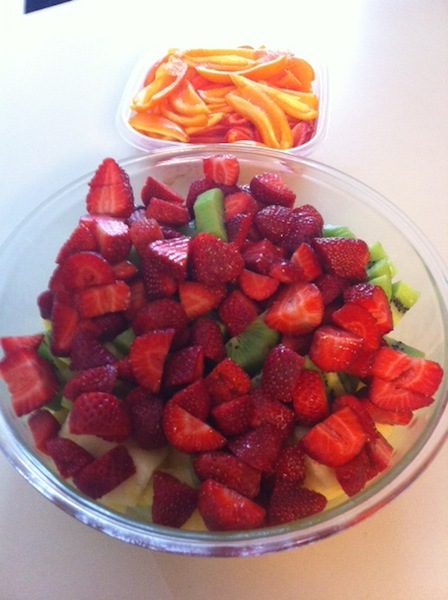 I hit up Aldi yesterday while I was out and about running errands and stocked up on fruits and veggies. I’m not always good about washing my veggies right when I get home, but when I do I find that I have less waste from letting them spoil. First things first. I had a few bananas that were on their last leg and decided to put them to good use. 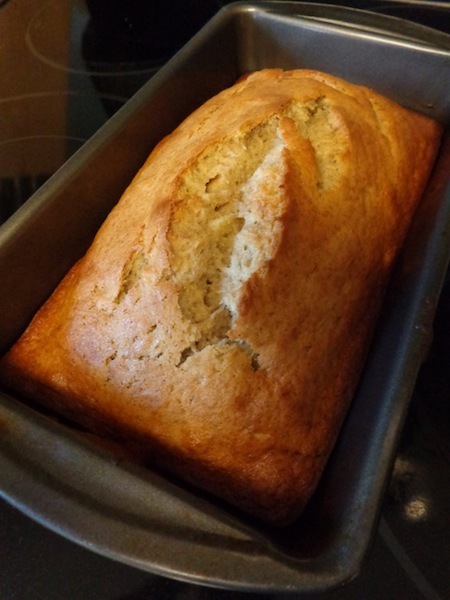 I whipped up some banana bread and put it in the oven. Here’s the finished product! I’ll share the recipe with you soon! 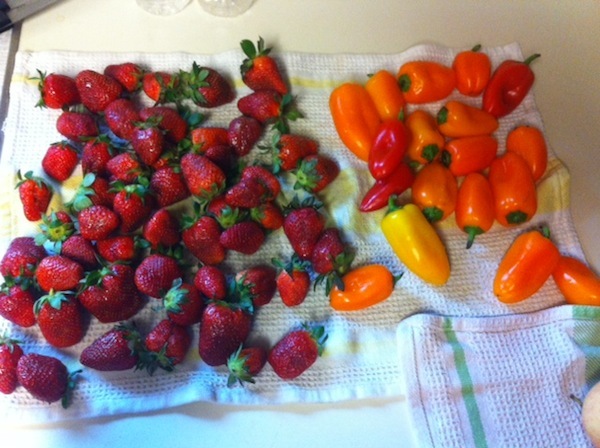 While the bread was baking I started the “fun” task of washing my fruit and veggies. 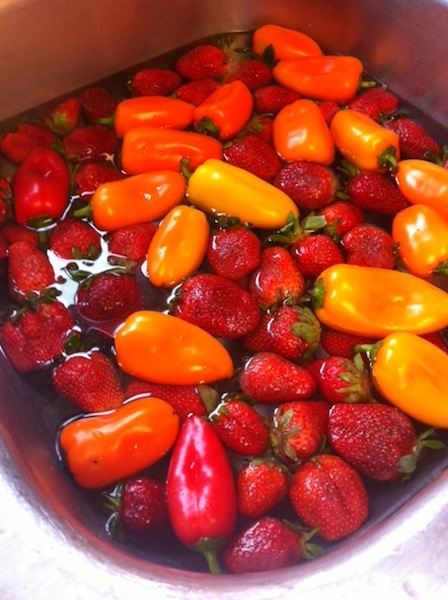 I filled the sink with water, added 1/2 cup of vinegar and let them soak for 10 minutes. My sister’s been encouraging me to eat more eggs to add more protein to my diet. 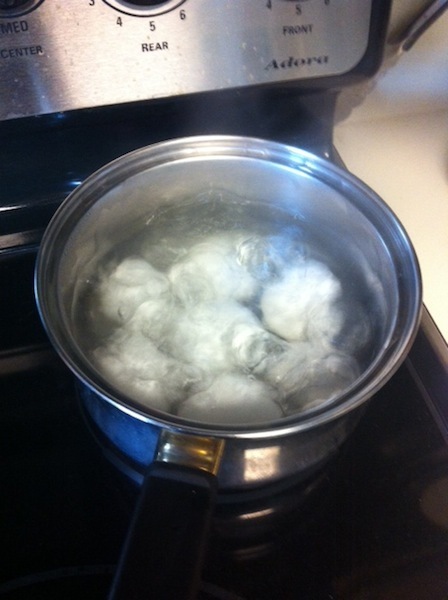 Why not boil a few eggs while I was already in the kitchen? I hate to admit it, but I’m not very faithful at washing bagged lettuce. (Yes, I know that’s bad!) 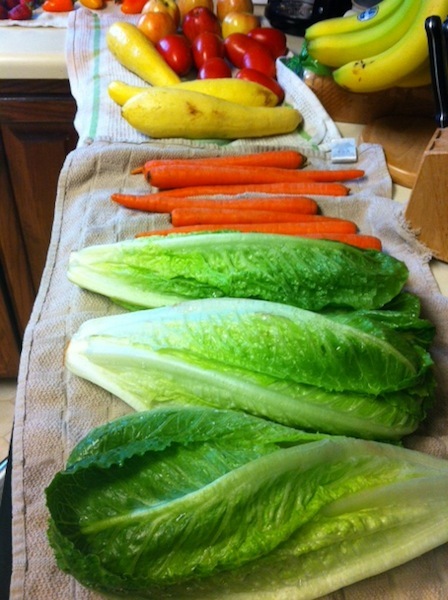 I’d love to hear any tips you might have for drying and storing your lettuce so that it keeps fresh. 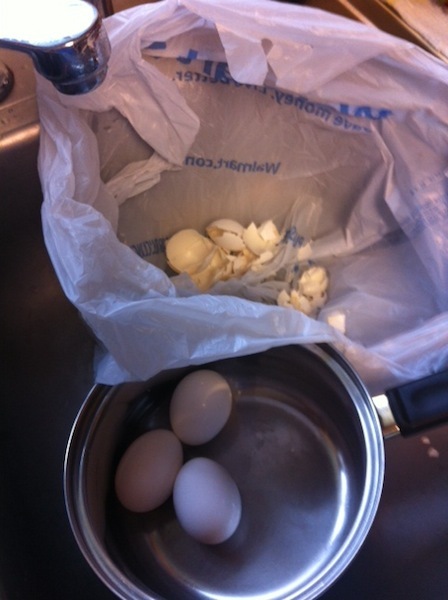 As I was waiting for the fruit to dry, I peeled my eggs. I used the same trick as I do when I’m peeling potatoes. Clean-up is so much easier! I was also able to clean out the fridge too! Now I just need to tackle mopping the floor. Ugh! I was amazed that I got all of this done in under 1 1/2 hours. 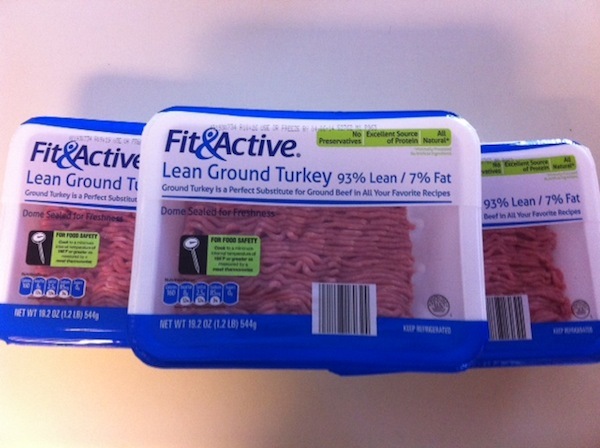 When the turkey meat finished cooking, I divided it into four freezer-friendly containers. It’s so handy to have on-hand for dinner prep! What kind of food prep/freezer cooking have you done this week? This didn’t happen today, but I just have to share it with you because it’s so cute. We finally told Jayden, our neighbor boy, about our surprise from the Lord. Trent came up with a creative way to tell him. He told him that he’s not going to be the youngest kid on our street anymore because there was going to be a baby. House by house, we talked about the five houses on our street. Jayden was quite perplexed and even when we came to our house, he couldn’t figure out who was having the baby. When he finally figured it out he just grinned. A few days later when he came over, he wanted me to go outside and play with him. I’m already a warm blooded person and, as you can imagine, now that I’m pregnant I get hot very easily. When I told him that I couldn’t go outside to play because I’d get too hot he said, “I already don’t like this pregnancy thing.” I couldn’t help but laugh! It’s never a dull moment at our house, especially when Jayden’s around! How’s your day going? What exciting things are happening at your house? I didn&5 know you could cook ground turkey in a crockpot. Live and learn! Jayden is hilarious! Nowadays it seems like you can cook just about anything in the crockpot! I’ve even seen recipes for bread! You surely know how to make the most of a day! It takes great time management to get all of that done. Way to go! 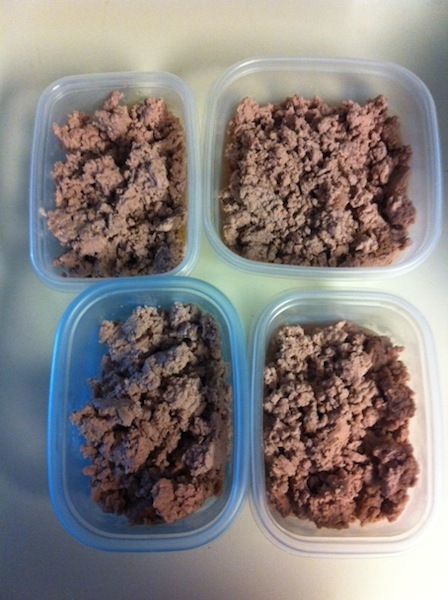 I’m an Aldi shopper also and love the idea of cooking ground turkey in the slow cooker. You don’t have to stand over it while it cooks, thus giving you time to concentrate on other tasks. Thanks for sharing!